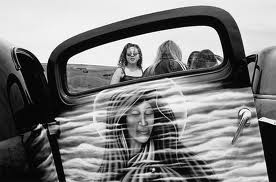 A different view of the Southwest U.S. with a personal touch is on view at Verve Gallery with the exhibit entitled “Descendants” by award winning photographer Norman Mauskopf. From a new book by the same title, the images are striking while combining the mundane with the essense of a sub-culture’s identifying uniqueness. on the Hispanic culture of northern New Mexico. The book is published by Santa Fe-based Twin Palms/Twelve Trees Press.